LINCOLN WRITES DURING THE CRITICAL DAYS BEFORE THE OUTBREAK OF THE CIVIL WAR CONCERNING THE SITUATION AT FORT SUMPTER. 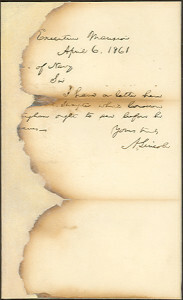 Autograph Letter Signed as President, one page, octavo, April 6, 1861 to Secretary of Navy Gideon Welles, the letter was partially damaged by fire, along with many other letters Lincoln wrote to Welles. Abraham Lincoln became President on March 4, 1861 and was immediately facing the secessionist crisis and imminent war. Within days, both the South and the North called for huge numbers of volunteers. On April 4th, two days before writing this letter, Lincoln had a relief force sent to Fort Sumter. On the day Lincoln wrote this letter, he met with the Cabinet and the Governors of Indiana, Ohio, Maine and Pennsylvania. The principal subject was the holding of the Federal forts in the South. Also on this same day, Captain Theodore Talbot had returned from a mission Abraham Lincoln had sent him on to Fort Sumpter and had met with the Governor of South Carolina, Francis Wilkinson Pickens. His report to Lincoln on the Fort Sumpter situation, and the meeting with the Governors, was given to Lincoln on this day, before he wrote the present letter. It is this report that he tells Secretary of War Welles that he wants given to Commodore Silas H. Stringham. In March, Silas H. Stringham, a veteran of the War of 1812, was summoned to Washington to discuss the relief of Fort Sumpter. The Secretary of the Navy, Gideon Welles, wrote in his diary about the trust he had in Commodore Stringham in their meetings. Stringham developed the plans for a relief expedition but was then given command of the Atlantic Naval Blockade. This letter was originally sold in 1924 in the auction of “The Valuable Papers of the Late Hon. Gideon Welles”. 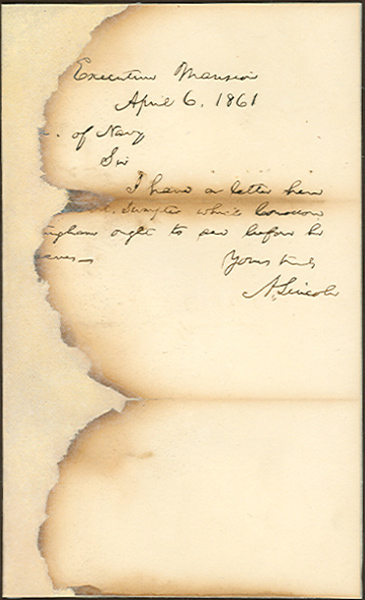 In the auction catalog all of the Lincoln letters are described as damaged by fire, clearly an event that occurred while in the possession of Lincoln’s Secretary of the Navy. Unframed; we can frame this letter for you or have a folder made for it.